If I'm not creating, I'm not dialed into my desires, or even awake to desire itself. If I'm not creating, I feel less...me. So here are some fire-starters for you, books to stoke the embers when the cold front moves in and settles over your studio, desk, conference room, or loft. 1. 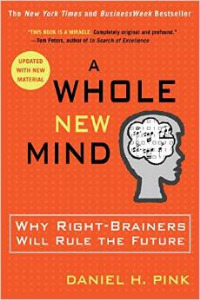 A Whole New Mind--Why Right-Brainers Will Rule the Future, by Dan Pink. This book makes a case why more than ever, right-brainers are increasingly found at the center of our cultural foundations, not simply as window-dressing. Skills like, "Design," "Story," "Symphony," Empathy," "Play," and "Meaning" are foundational attributes right-brainers bring to a culture that needs them more than ever. 2. Your Creative Brain, by Shelley Carson. The author describes seven brain sets: "Connect," "Reason," "Envision," Absorb," "Transform," "Evaluate," and "Stream'" and provides exercises, quizzes and self-tests. My self-tests showed that I function optimally in the "Envision," "Absorb," and "Evaluate," brain sets; and prefer a "spontaneous" pathway. 3. Scribbling in the Sand - Christ and Creativity, by Michael Card. Not a how-to, but a why-to book. Card explores the biblical roots of creativity and imagination; and includes not only Card's wisdom for the creative mind, but also includes letters of advice from other artists and creatives leaders. What are the best books you've read on creativity? Share the high-points so that others can get inspired. Posted on March 13, 2015 by Jim Robbins.